The Internet has ushered in a new era of creativity and personalization. Everything from cameras to computers are now available in a variety of different colors or finishes. People today like to feel like their possessions reflect their tastes and personality. It’s no different when it comes to choosing wedding bands. Many couples today are opting for handmade wedding bands and rings in order to obtain a high degree of both quality and customization. There are two things that determine the overall quality of a handmade wedding band: the quality of the materials used and the skill of the artisan. A truly talented jewelry designer can create a ring that allows your to showcase your personal style as your begin your life together as husband and wife. Some jewelry makers work on a small scale. If you want to work directly with the individual who will make your rings, etsy.com is a good place to start. Etsy is a web site that specializes in handmade goods. They even have a section called “Alchemy” where you can elaborate on your own vision for a ring and then get bids from artisans who are willing to produce it for you. You can even look for jewelry designers in your own geographic area through etsy’s search function. Other places that sell handmade jewelry still have a central production facility where many artisans work together to create wedding bands. This way they’re able to maintain consistent quality across the brand. If you’re shopping for handmade wedding bands at a national chain store, such as Helzberg or Kay, they probably came from place like this. Other sites, like BlueNile.com, have a “Build Your Own Ring” section where you can choose the style, setting and the stone and they will make your ring and ship it to you. 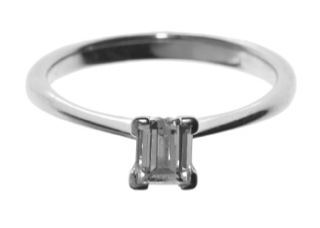 Blue Nile is the largest online retailer of rings. Many different materials can be used to make wedding rings. Precious metal is the most common choice. For years gold was the traditional material used. These days, platinum and titanium are also commonly available. 14 karat (14K) gold is a popular choice because of its warm tone and relative strength. 14K gold contains 14 parts gold and 10 parts other metal or metals, making it 58.3% gold. 14K gold is a great combination of beauty and durability, as the other metals added to it make it a bit harder. 18 karat (18K) gold has a higher percentage of pure gold melded into it. 18K gold is 18 parts gold and 6 parts other metals, making it 75% gold. 18K gold may develop a weathered patina over time since is a slightly softer, however, this patina can be quite beautiful and it’s highly desired by some people. 24 karat (24K) gold is pure gold. Generally 24K is not used for rings because it gets dented more easily. It is sometimes used for other jewelry, like earrings, that don’t get as much wear. The gold alloys give a jewelry maker a chance to be creative and play with color. This sets handmade wedding bands and rings apart from the rest. Designers that work with Black Hills gold, for example, often incorporate three different colors of gold into one piece. White gold is created by mixing nickel or palladium with the gold. Rose or pink gold is created by adding copper to the gold. Green shades of gold are created with the addition of silver. Some couples prefer that their handmade wedding bands be made out of platinum. Platinum has a shiny, white luster that looks particularly good with diamonds. It’s also very hard and won’t be worn away as easily as gold. A platinum setting will hold a gemstone firmly in place. Jewelry must contain 950 parts of platinum per thousand to be marked as “platinum.” Jewelry that contains less platinum will be marked with the amount of pure platinum in the mix. For example, a ring that is 850 parts platinum will probably be marked “850 plat” on the inside. Usually platinum is used in its purest form to make wedding bands. Although platinum looks sleek and radiant on its own, some jewelry designers enjoy adding touches of yellow gold. This creates a beautiful contrast and also allows the wedding bands to mix easily with other pieces of jewelry in your collection. Many men like platinum rings in simpler styles. The price of gold has gone up significantly in the past few years, so now there’s little difference between the cost of platinum and gold rings. Budget-minded couples could even choose 10K or 12K gold bands to save on cost. Titanium is another option that is also budget-friendly. If you want something really, really unique, you can also find handmade wedding bands made out of wood, glass, silver spoons and other unusual materials. One of the best features of a handcrafted wedding band set is the enormous variety of styles and designs. Like a rustic look? Maybe a hammered finish is the one for you. If elegance is your thing, a ring featuring a single or double braid can look quite sophisticated. You could add some Irish flair with a ring featuring Celtic knot work. One very popular Celtic design for wedding rings is the Claddagh, which features a heart that is held by two hands and topped by a crown. This particular design represents love, loyalty and friendship. Another wedding band style incorporates three separate but interwoven bands that symbolize love, faith and hope. If you appreciate things with a sense of history, vintage or antique rings might hold a special place in your heart. Half the fun of finding the perfect antique rings is the search itself – it can be like a treasure hunt that bonds you and your partner closer together. Between the different styles and materials that are available there is an endless array of choices to ensure that you can flaunt your personal style while demonstrating your commitment to your life partner. The nice thing about handmade wedding bands and rings is that there is such a wide variety. It’s easy to find something for almost every budget. You can get a simple ring for under $50, or spend thousands of dollars to get gold rings with dazzling, high-quality diamonds. Regardless of the price, the sentiment and the symbol is the same. Choosing handmade wedding bands and rings is a wonderful way to celebrate the your new union as husband and wife.